Are you a student at college or university? Are you looking for a chance to build your skills and experience during the holidays? Perhaps you're studying towards a conservation, geography, environmental management, biology, science or educational qualification? 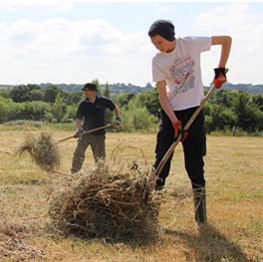 Here at Carymoor you can get involved in all kinds of voluntary work based on your interests, from conservation tasks such as hay raking in our meadows to helping to run our educational activities for school groups. Not only will you learn new skills and gain experience to boost your CV, but you'll be working in the great outdoors on our nature reserve and helping to protect vital habitats for wildlife. Step 1: Sign up for an account on Care with Carymoor or sign in and accept this challenge. Step 2: We will get in touch to chat about your interests and how you'd like to get involved.